I wrote earlier about Paul Revere’s Midnight Ride, noting that Liberty Paper Mill customer Richard Devens was waiting in Charlestown for Revere to arrive by boat over the Charles River. In one of those strange twists of fate and history, this scene would repeat itself in an eerily similar fashion more than 85 years later near Leesburg, Virginia, in a battle that became known as Ball’s Bluff. Early the next day, Lee sent a note to Revere that Devens has been engaged in a skirmish and that “we are determined to fight.” Revere began crossing his five companies of the 20th with two mountain howitzers from the island to the bluff. There were just enough boats for Revere to get the 20th Massachusetts and the howitzers to the battle. But when things went badly, there weren’t enough boats nor enough time to get all back to safety. Devens, injured in the battle, was able to swim to safety. Revere and Lee, both wounded, were not so lucky. They were captured and spent several months in a Confederate prison camp. Devens distinguished himself throughout the war. His troops were the first to occupy Richmond after its fall in April of 1865. He was named a judge of the Massachusetts superior court, from 1867 to 1873, and was an associate justice of the Massachusetts Supreme Judicial Court from 1873 to 1877, and again from 1881 to 1891. From 1877 to 1881, he was Attorney General in the Cabinet of President Rutherford B. Hayes. Fort Devens in central Massachusetts, which opened in 1917, was named in his honor. After Revere’s prisoner exchange, he participated in the campaign on the James River, and at Antietam was on General Sumner’s staff. There he was complimented for his gallantry, having received a severe wound. Upon his recovery he was promoted as Colonel of the 20th Regiment. He was killed at the Battle of Gettysburg, defending a pivotal position during Pickett’s Charge. 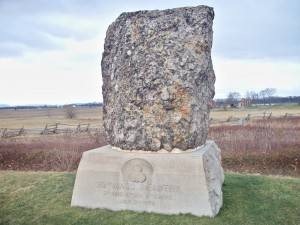 An unusual monument—a puddingstone boulder—was erected in memory of Revere and the 43 other men of his company who died at the Battle of Gettysburg. The 30-ton colossus, dedicated in 1886, was imported by train from Roxbury, Mass., where many of the soldiers grew up. Now, it can be visited on Hancock Avenue, near the immortalized “copse of trees” and the Confederate High Water Mark. Dr. Edward Hutchinson Robbins Revere, a brother, enlisted as an assistant surgeon in the 20th. While his brother was proving his gallantry at Antietam, Dr. Revere was killed by an exploding shell while caring for a wounded soldier. First cousin, Joseph Warren Revere, also served in the Civil War, rising to the rank of Brigadier General. But his conduct at the Battle of Chancellorsville caused him to be court-martialed. President Lincoln overturned the court’s ruling, but accepted his resignation.